(CNN) -- A day before the partial openings of two luxury hotels damaged by terrorists in Mumbai last month, an Interpol delegation visited India to offer expanded access to global databases and high-tech investigative tools. 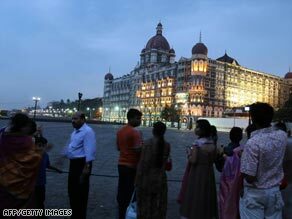 The Taj Mahal Palace's main building is expected to remain closed until next year. Secretary-General Ronald Noble met Saturday with India's Union Minister of Home Affairs, Palaniappan Chidambaram. Terrorists using bombs, grenades, gunfire and fire caused the deaths of more than 160 people over three days of sieges throughout the city that is India's commercial capital. They took hostages at the Taj Mahal Palace and Tower and Oberoi-Trident hotels. The assaults that began November 26 also targeted a historic train station, a Jewish cultural center and other landmarks. Home Ministry sources said Interpol has compared details of the nine terrorists who were killed and the one who was captured alive -- such as names, fingerprints, DNA profiles and photographs -- with the agency's global database of fugitives. To further aid security, state police, immigration, border-control units and other Indian law enforcement groups will be allowed to use databases accessed by the Interpol National Central Bureau in New Delhi, Interpol added. The agency said it will offer India its state-of-the-art technology to help the country tighten its border-control system, allowing Indian law enforcement authorities to instantly identify anyone attempting to fraudulently enter the country by air, land or sea, Interpol said. Meanwhile, sections of the two luxury hotels targeted in the attacks will open Sunday with tightened security, their management said. Nearly 270 rooms in the tower wing of the Taj Mahal Palace and Tower, nine suites and 26 club rooms will be available for guests Sunday night, the hotel said in a written statement. A hotel operator said rooms Sunday night were going for $250 to $373, depending on the view. The tower was built in 1973. Workers could be seen decorating a large Christmas tree in the tower lobby, and smaller trees elsewhere. Restaurants also will be open. "We dedicate our reopening to the city of Mumbai as affirmation of the values of courage, resilience and dignity," Raymond Bickson, managing director and CEO of Indian Hotels Company Limited, said. The Tower, built in 1973, adjoins the historic Taj Mahal Palace hotel, which was heavily damaged by fire and won't be open until sometime next year, a hotel source told CNN last week. The 1903 wing of the Taj Mahal combines Moorish, Oriental and Florentine styles, and also offers wide views of the Arabian Sea. The domed building has vaulted alabaster ceilings, onyx columns, hand-woven silk carpets, crystal chandeliers and collections of art and furniture. "There was a lot of damage in the palace wing," the source said. "The extremists had an open fire in the hotel" and left "a lot of bullet marks on the marble and the ceilings." But he said the old section's 105-year-old stone structure is "completely safe," and security has been "really, really strengthened." The Oberoi Group said it will reopen 100 rooms in the Trident portion of its Nariman Point complex Sunday morning. The group owns and manages the five-star Trident-Nariman Point hotel and the adjacent Oberoi. It could take up to seven months for the Oberoi to resume functioning, a senior official told the Hindustan Times. India contends the Pakistan-based, Islamic militant group Lashkar-e-Tayyiba, (LeT), for training the militants who carried out the attacks. The group has denied responsibility. On Saturday, speaking at a conference in New Delhi, Indian Foreign Minister Pranab Mukherjee said the only suspected terrorist in the Mumbai attacks to be captured alive has provided "chilling accounts of his handlers."